Mark E. Battersby is a freelance writer who has specialized in taxes and finance for the last 25 years. Working from offices in the suburban Philadelphia community of Ardmore, Pennsylvania, Mr. Battersby currently writes for publications in a variety of fields, syndicates 2 weekly columns that appear in over 65 publications, and has written 4 books. He can be reached at MEBatt12@Earthlink.net. Whether as a result of a booming economy, tighter immigration laws, or an educational system gone astray, finding qualified job applicants has become increasingly more difficult for those in the construction and engineering industries. Even more troubling for many smaller businesses is the question of how they can compete for badly needed, qualified workers? Fortunately, thanks to our unique tax laws, every construction company and engineering firm can afford to offer fringe benefits to their workers, and may even be able to benefit themselves. That’s right, our tax laws merely prevent employers from discriminating in favor of owners, key employees, or other highly-compensated individuals when setting up any benefits plan that is to be tax deductible by the business and tax free to the recipient. Fringe benefits are often defined as property and/or services whose benefit to employees frequently outweighs the cost to the employer. With a number of notable exceptions, fringe benefits are generally included in an employee’s gross, taxable income where they are subject to income tax withholding and employment taxes. However, while some fringe benefits are included in an employees’ taxable wages, other fringe benefits aren’t taxable wages and, yet, remain deductible by the employer. Among these exceptions are nontaxable fringe benefits, so-called “qualified” fringe benefits such as health insurance, medical expense reimbursements, dental insurance, education assistance, and day-care assistance. Tax-qualified benefits are deductible by employers and totally free of federal and state income taxes as well as the employee’s Social Security and Medicare taxes. These tax savings obviously make fringe benefits an attraction. However, thanks to last December’s Tax Cuts and Jobs Act, the array of tax-free fringe benefits that employers can provide employees is not quite as generous as it used to be. Surprisingly, survey after survey shows that it is not money alone that attracts new workers and keeps existing employees on the job—the benefits are also a big pull. In fact, currently treasured by job seekers—and employees—are flexibility and the opportunity to balance work with other life responsibilities, interests, and issues. But, obviously, no engineering firm or construction business can be an employer of choice without a good benefits package. 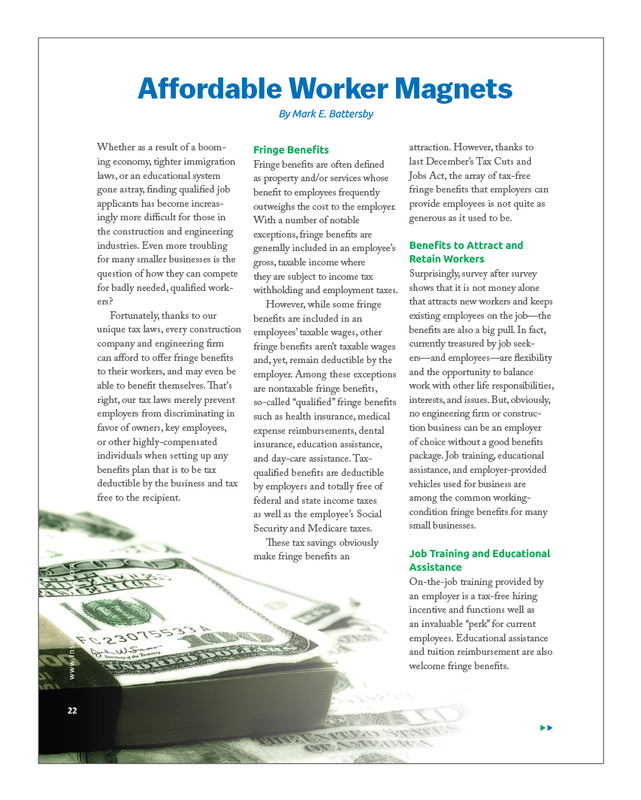 Job training, educational assistance, and employer-provided vehicles used for business are among the common working-condition fringe benefits for many small businesses. On-the-job training provided by an employer is a tax-free hiring incentive and functions well as an invaluable “perk” for current employees. Educational assistance and tuition reimbursement are also welcome fringe benefits. A formal, written educational assistance plan doesn’t require immediate employer funding, only to provide reimbursement for an employee’s educational expenses—up to $5,250 per employee, per year and exempt from tax. Educational assistance doesn’t just include tuition assistance, but also payments for books, equipment, and other expenses related to continuing education. Job seekers and employees are increasingly looking for cafeteria-style benefit plans in which they can balance their choices with those of a working spouse or partner. Profit-sharing plans and bonuses that pay employees for measurable achievements and contributions are invaluable. Every engineering firm principal and construction business owner should keep in mind that, in today’s job market, compensation remains an important factor. By surveying the local job market and the compensation offered by others in the construction and engineering industries, an employer can pay better than average to attract the best candidates. Benefits offered by a construction company or engineering firm should also be above industry standards with new fringe benefits added—when they are affordable. Existing employees should be educated about the true dollar value of their benefits so they appreciate that their needs are being addressed. Bonuses and awards must, as mentioned, be included in an employee’s taxable income. Should the bonus or award be in the form of goods or services, employees must include the fair market value of those goods or services in their income. The same applies to holiday gifts. However, employees receiving turkeys, hams, or similar items of nominal value from their employers at Christmas or other holidays may exclude the value of the gift from their income. A profit-sharing plan, often called a deferred profit-sharing plan (DPSP), is a plan that gives employees a share in the profits of the business. Under this type of plan, an employee receives a percentage of the operation’s profits based on its quarterly or annual earnings. This is a great incentive to attract new workers and a way to give employees a sense of ownership in the business. Not too surprisingly, however, there are restrictions as to when and how a person can withdraw these funds without a penalty. The contribution limit for a engineering firm or construction company sharing its profits with an employee is the lesser of 25% of the employee’s compensation, or a maximum of $56,000 ($55,000 in 2018). In order to implement a profit-sharing plan, the business must file a Form 5500-series return/report and disclose all participants of the plan. Early withdrawals, just as with other retirement plans, are subject to penalties. An Employee Stock Ownership Plan, or ESOP, is an employee-owner program that provides workers with an ownership interest in the business—tax free. An ESOP is a qualified defined contribution employee benefit plan designed to invest primarily in the stock of the employer. In general, employees are provided with ownership with no upfront cost. The shares provided can be held in trust for safety and growth until the employee retires or resigns. At that time, the shares go back to the business for further redistribution or are completely voided. Health benefits—Health benefits are by far the single most important fringe benefit. Health benefits include providing employees with health, dental, and vision insurance as well as paying health-related expenses. Group term-life insurance—A business can provide up to $50,000 in group term life insurance to each employee tax-free. Dependent care—Up to $5,000 in dependent care assistance can be provided to an employee tax free. Of course, many working parents may qualify for a tax credit for child and dependent care. Working condition fringe benefits—Working condition fringe benefits are anything provided or paid for by an employer to help someone do their job. Local and long distrance travel for business, business-related meals and entertainment, professional publications, and company cars used for business driving are all good examples of tax-free working condition fringe benefits that are tax deductible by the employer and tax free to the employee/recipient. The former deduction of so-called “Employee Business Expenses” was eliminated by the Tax Cuts and Jobs Act, along with many other personal expenses previously allowed on individual tax returns. Disallowed were those expenses formerly deductible subject to a 2% floor. Long-term care insurance—This insurance covers expenses such as the cost of nursing home care. While premiums are not taxable benefits, benefits received under the insurance may be partly taxable if they exceed certain limits. So-called “de minimis” benefits may be worth little or nothing in the eyes of our lawmakers, but go a long way toward making employees—and prospective employees—happy without an accompanying tax bill. De minimis fringe benefits refer to any property or service that is so small in value that accounting for it is unreasonable or administratively impractical. A business with happy workplace is often an attraction for job seekers. Whether it’s a nightclub affair or a buffet in the business’s break room, parties are a tried-and-true benefit. And, in addition to making employees feel valued and keeping them motivated, parties have tangible tax benefits. Last December’s Tax Cut and Jobs Act included important changes to the tax treatment of employer-sponsored benefit programs. The new law restricts an employer’s ability to deduct many common business expenses, such as meals, entertainment, and employee moving expense reimbursements. On the upside, the law also included a new tax credit for employers who provide paid family and medical leave for their employees. The tax credit, a direct reduction in the tax bill rather than a deduction used to reduce taxable income, is available when compensation for employees is $72,000 or less. In order to attract talented individuals to work for the engineering firm or construction business, as well as to retain qualified employees, today’s employer must offer fringe benefits and other perks. Once it has been determined what benefits will best attract badly needed workers in today’s job environment, which benefits employees would prefer, and which benefits the business can really afford, then and only then, will it be possible to make an informed choice of which benefits will attract job applicants, benefit your engineering firm or construction company and your employees the most. Knowledge is essential when deciding which benefits work in today’s job market—as are the services of a qualified professional. But, wouldn’t it be wonderful if those benefits turned out to be the ones that cost your operation the least? Amazon Business: Foe with Benefits?